Mother&apos;s Day weekend is here, and if you&apos;re celebrating in Pierce County, there are plenty of events and activities happening around the region. When I was growing up, we would ALWAYS make mom french toast, pluck a bouquet from our garden, and bring her breakfast in bed - complete with a handmade art project. Now my mom prefers experiences over gifts, and would rather spend time with her children and family than receive gifts. So, inspired by her, I&apos;ve rounded up five Mother&apos;s Day events in Tacoma and Pierce County so that you can give your mother memories and experiences to remember. To all the moms, grandmas, step-mothers and moms-to-be... Happy Mother&apos;s Day! Thanks for all you do for us kiddos, from the time we&apos;re small til we&apos;re grown. Treat your mom to an elevated brunch experience. 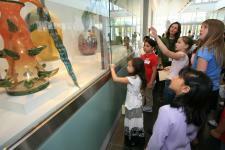 The Tacoma Art Museum and Pacific Grill are teaming up to provide an artful Mother&apos;s Day brunch. Brunch reservations include admission into the TAM, so after you enjoy top-of-the-line cuisine, peruse the museum at your leisure. This is the last chance to catch the Outwin Portraiture Exhibit before it heads to it&apos;s next destination! Galleries provide great conversation material, and the unique brunch experience will create a memorable Mother&apos;s Day for all attendees. This event is suitable for all ages. 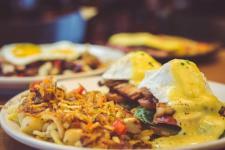 Brunch is served buffet style, and there are three seating times at 10:00 AM, 11:30 AM, and 1:00 PM. 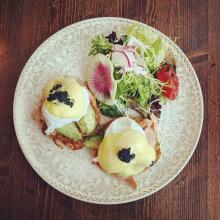 Call ahead for reservations, and check out the brunch menu online. Kids can create take-home artwork at the TAM studio, and you can snap a family portrait at the 1000 Words photo booth, creating two scrap-book worthy event takeaways. 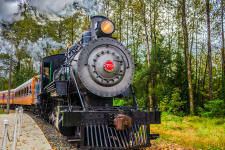 Get out of the city, and take a special train ride through the foothills of Mount Rainier. It&apos;s springtime, which means the forests and flowers are starting to come alive. Lush greenery and a snowcapped mountain scenery make this a peaceful and idyllic way to spend your Mother&apos;s Day. Trains depart from Elbe at two times, 11:00 AM and 2:15 PM, which give you flexibility in planning your day. Since you&apos;re driving out there already, I say make a day of it and visit Mt. Rainier National Park. Springtime is waterfall season at the park, and there are quite a few easy-access waterfalls right off the road to Paradise - ask the Park Ranger for recommendations as you drive through the Nisqually gates. Check the National Park twitter page for road conditions before you head out, and if the road is clear consider driving up to Paradise for memorable dining experience at the Paradise Inn. Perfect for adventurous or active moms, Outdoor Adventures is offering guided kayaking trips along the Foss Waterway for Mother&apos;s Day. This 3-hour outing is family-friendly, includes all equipment, and is open to everyone regardless of experience. After turning in your life-jackets, spend time exploring the renowned Museum District in downtown Tacoma, which includes the one-of-a-kind Chihuly Bridge of Glass and access to six museums. There&apos;s plenty of dining along Pacific Avenue, so if the morning paddle works up your appetite, grab a crepe at Savor, hand-tossed pizza at Elemental, or hearty pub fare and craft beer at the Harmon. 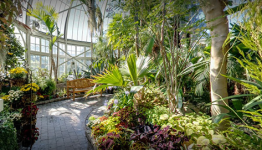 Mother&apos;s Day falls on the second Sunday of the month, which means the W.W. Seymour Botanical Conservatory is hosting live music! 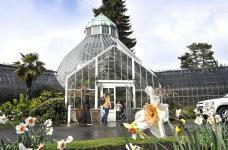 Mom&apos;s will enjoy the acoustic music and lush tropical flora in the beautiful Victorian conservatory. This week the Pacific Northwest Chamber Ensemble will be filling the conservatory with a vibrant acoustic performance. Concert admission is a suggested $3 donation. What&apos;s the perfect compliment for a park outing? Milkshakes. Treat your mom to a classic from Frisko Freeze, or a decadent treat at Shake, Shake, Shake, both within walking distance and both named in the top six best milkshakes in the South Puget Sound. If you plan to celebrate Mother&apos;s Day on Saturday, then visiting the Point Defiance Zoo and Aquarium is a great value, as Mom&apos;s receive half-off general admission. If you haven&apos;t been to the zoo recently, there&apos;s a whole host of new and exciting things. This Thursday was the grand re-opening of the Rocky Shores aquarium exhibit, which replicates the rocky Washington coastline and houses four playful Pacific walruses. 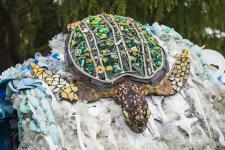 The zoo is also currently hosting Washed Ashore: Art to save the Sea. These huge ,colorful art installations make great photo ops, and teach about marine conservation - kids can pick up a scavenger hunt sheet from the zoo and, suddenly, the installations become interactive! 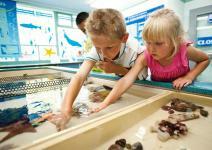 Families can also touch stingrays and sea stars in the aquarium touch tank, feed birds in the Budgie Buddies exhibit, and learn about animals at Keeper Talks. 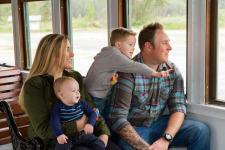 With so much to do, an outing at the zoo is sure to be a memorable way to celebrate Mother&apos;s Day. Looking for more Mother&apos;s Day suggestions? 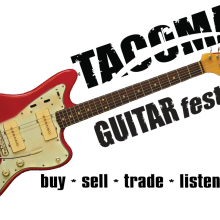 Here&apos;s how to win Mother&apos;s Day in the South Sound.